I’ve only read a handful of the original Dresden Files books/stories, and a slightly larger handful of these Dresden Files graphic novels, but I’m really enjoying this graphic novel series much more than I would have expected to like them. In this latest edition, Harry Dresden … wizard detective … has been called to rural Mississippi by one of the leaders of the White Council of Wizards to help investigate recent murders. The culprit(s) would appear to be rather obvious – a clan of giant Dog Men have made the nearby woods their home – and Harry Dresden, sore, tired, and cranky, reacts on his short fuse instead of listening to the patience of the elder wizard, which results in a near-disastrous battle. And though the council wizard winds up in the local hospital, he has his doubts as to whether the violent, reactive Dog Men are responsible for the spate of human murders in the community, and Harry, coming to his senses, meets an old foe and discovers who might really be at the heart of the evil in this rural community. I’ve come to really look forward to reading these graphic novels and it may be one of the only on-going graphic novel series that I continue to enjoy. Writer Mark Powers captures the spirit of Harry Dresden that I have imagined from the books that I have read, and he gives the character heart and soul and a lot edge. The art here, by Diego Galindo, blends beautifully with Powers’ script and this is one of the few times that I don’t feel like I’m reading/looking at a graphic novel because it’s all integrated so well. I liked seeing Harry struggle – not so much with other magical creatures, but with his own personality. And nice to see some council wizards who aren’t just out to ‘get’ him, but perhaps try to help him for a change. Though there was nice rising action and a late ‘cavalry to the rescue’ finale, and the fact that Harry had to control his instincts in order to lead that cavalry (which really helped my enjoyment of the story), I felt as though the end came too abruptly. Harry’s discovery of the true villains here was handed to him and was, I felt, too easily overcome. Still, I enjoyed this story immensely and I really look forward to these graphic novels. Looking for a good book? 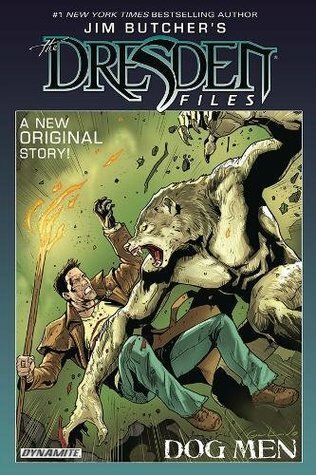 Jim Butcher’s Dresden Files: Dog Men is another story in the graphic novel series that really engages the reader and should be appreciated by all fans of Harry Dresden.